Comms chief Walter De Gregorio said Wednesday is "a good day for FIFA." Crisis communicators didn't believe him. A Wednesday morning emergency press conference by FIFA comms and public affairs director Walter De Gregorio after the arrest of officials from the international soccer body on corruption charges has gotten a red card from PR gurus and news outlets. US authorities charged 14 people, including nine soccer officials, on Wednesday morning with orchestrating a long-running kickback scheme to enrich themselves. De Gregorio, who faced the music alone at the Zurich press event, attempted to give a positive take on the crisis. He downplayed the arrests and denied that FIFA was in crisis, claiming the governing body had initiated the investigation when it went to the Swiss attorney general in November 2014. De Gregorio also commented that FIFA President Sepp Blatter, who was not charged, is "calm" but "not dancing in his office." 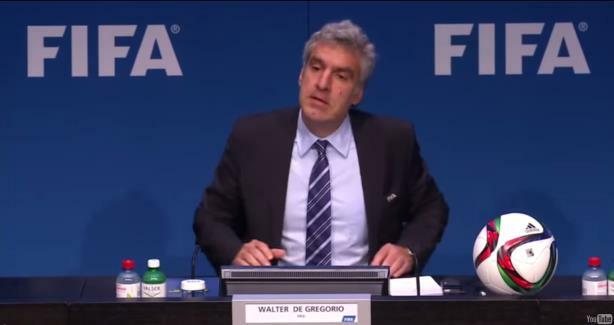 Crisis communicators lambasted De Gregorio’s statements, tone of voice, and "arrogant" stance, as well as FIFA’s overall handling of the crisis, on Twitter. Sending your head of comms out - on his own - to defend the unity of FIFA at a global presser. Dare I say #OwnGoal? Every single person at FIFA, including head of comms, come across as so arrogant. FIFA’s website, which live-streamed the press conference, also suffered technical glitches. Others questioned how the comms teams of FIFA sponsors will react.